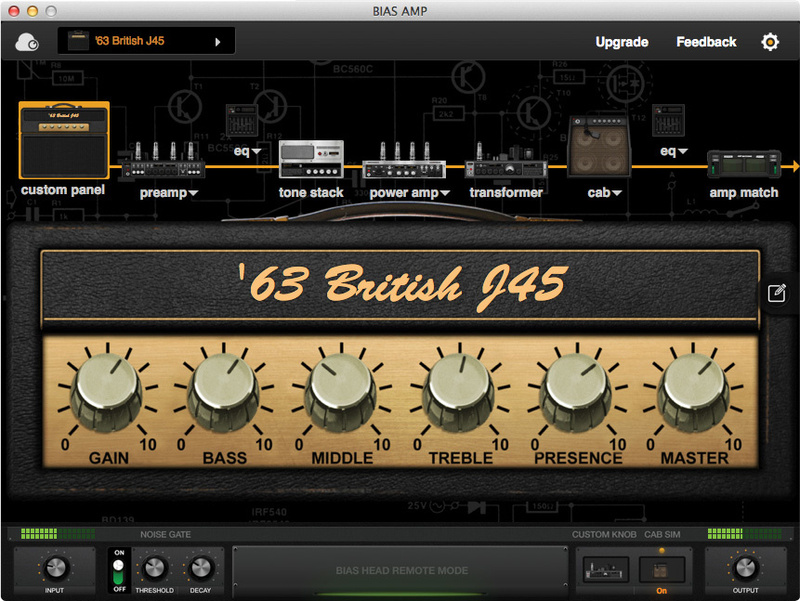 Insanely tweakable, and promising the ability to mimic your own amp, could this be the last word in amp modelling? For any guitarist, there’s a reassuring air of familiarity and class about the Bias Head’s black, grey and silver enclosure, but its front and rear grilles are purely cosmetic — inside lurks a 25-preset, deeply programmable combination of Positive Grid’s highly regarded Bias Amp software, the DSP to run it, and a 600W Class-D power amp. And the result might appeal equally to the incessant tweakers and those who just want to plug and play. Other than the global output level, the front-panel controls are all programmable. The single input jack sits on the left of the lower of two rows, and this hosts familiar gain, bass, middle, treble, presence and master controls, as well as a Modern/Vintage voicing switch. The upper row is less familiar territory: the first two knobs are five-position rotary switches, and these select between the five preset banks (Clean, Glassy, Blues, Crunch and Metal), and the five presets within each bank. Adjacent to these is a second pair of controls, the first of which switches in up to five cascading preamp tube stages. The other modifies the overall level of distortion in the selected stages. A Bright/Normal preamp voicing toggle-switch sits between them. Next comes a four-position switch that sets the power-amp topology. You can choose from: Single-Ended (tube Class A); Split Load (tube Class A/B with a split-load ‘concertina’ phase splitter); Push/Pull (tube Class A/B with a long-tailed pair phase splitter); and Solid State (transistor). A rotary Power Amp control governs the chosen power-amp stage’s distortion. The Custom knob can be programmed to carry out one of a range of functions, and, finally, there’s a cab simulation on/off toggle switch, with associated blue/red bi-colour LED. The back-panel I/O, also arranged in two rows, includes two sets of L-R line outputs (XLR and TRS jack) with switched ground lift, followed by a headphone output and the TS jacks of the mono effect loop, with its own switched ground-lift. 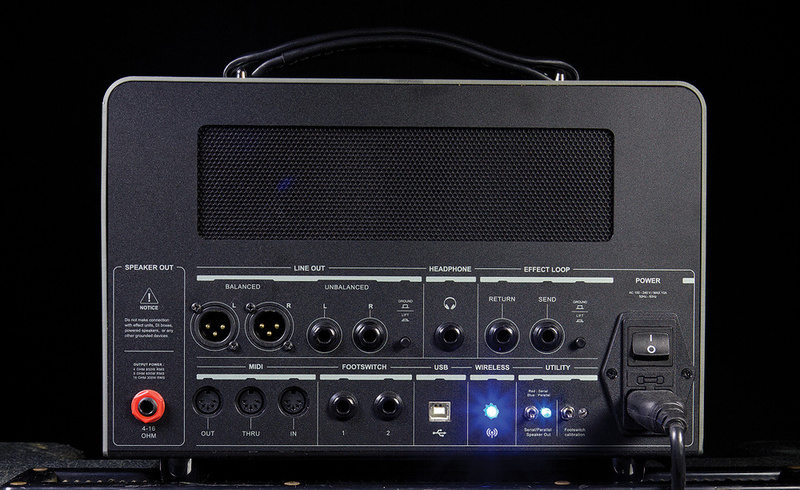 The speaker output (850W at 4Ω, 600W at 8Ω, and 300W at 16Ω) is joined on the bottom row by the MIDI out/thru/in connectors and the TRS jacks for footswitches 1 and 2. Footswitch 1 is compatible only with I2C protocols for Positive Grid products, and footswitch 2 accepts only latching footswitches. Despite the guitarist-friendly styling, a bright blue light by the Bluetooth logo rather gives the game away that this is no normal amp! The B-type USB socket allows connection to a Mac (Mac OS 10.9 onwards) or Windows (7 SP1 onwards, or 8) computer, to use with Positive Grid’s Bias Amp Desktop Mac/Windows software and the iOS equivalent, and this enables you to program the Bias Head’s presets or to load emulations from your computer. After this lies the illuminated-when-on Wireless switch that turns on the Bias Head’s Bluetooth 4.0 transceiver, allowing you to connect an iOS device (iPod Mini, Air, Pro, 3rd generation or later) running the mobile version of the Bias Amp software. Two Utility toggle switches come next, one of which puts the footswitch inputs into calibration mode. The other switches between serial and parallel modes, turning its bi-colour LED and that of the cab Sim from red to blue as it does so. Rather than switch the effect loop between series and parallel, as in a conventional guitar amp, this sets the slightly restrictive output routing of both the effect-loop return and the Bias Head’s cabinet simulator. But with the Bias Head you get a Redeem Code to activate a full (Professional) licence of Bias Amp. The user interface is functionally identical on both desktop and iPad versions, the only difference being that the controls for the Noise Gate and Room Control sit in pop-up windows on the iPad. 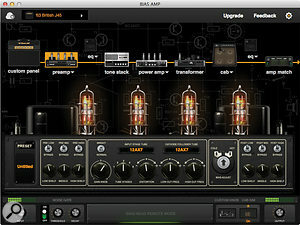 Once Bias Amp Professional or the iPad version is running, a USB- or Bluetooth-connected Bias Head will be recognised automatically. Communication between Bias Amp and the Bias Head is bidirectional (moving a control in Bias Amp changes the value, though it doesn’t alter the position of the Head’s corresponding physical control). Each amp model comprises eight blocks: Custom Panel (where you can alter the software version’s cosmetics); Preamp; Tone Stack; Power Amp; (output) Transformer; Cabinet emulation (which can be bypassed); and, finally, two eight-band EQs/spectrum analysers. 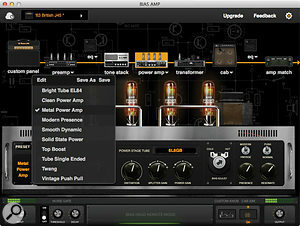 The hardware amp’s settings can be micro-managed using the Bias Amp software. Here, you can see the ‘home screen’ of a preset. By clicking on a stage in the signal flow mapped out at the top, the lower part of the screen changes to give you much deeper control.Clicking on a block brings up its controls, and each block contains multiple presets, allowing you to build new amp models very quickly. You can mix and match 11 preamps, eight tone stacks, 10 power amps, seven transformers and 30 cabs (that’s a total of 184,000 different amp models if my maths are correct!) and, if you wish, tweak each and every block in each and every amp. Alternatively, you could start from the cleanest preset (Acoustic) and build your own tube amp more or less from scratch. Once you’ve designed a nice control panel, open your choice of four preamp types (Standard, Glassy, Crunch and Insane) and you’ll find a three-band filter sitting at its input, shaping the sound going into the preamp. The high- and low-frequency controls have a shelving response, the mid has a peaking response and all three can be individually bypassed. The preamp stage’s settings are accessible.Tube-swapping is a familiar gain and tone-shaping technique, and Bias Amp allows you to swap the input stage and cathode-follower (output) triode tubes for, in descending order of gain, a 12AX7, a 12AT7 or a 12AU7, giving you the option to experiment with nine basic gain configurations before you start playing with the ‘front panel’ gain knob, above which sits the Bright/Normal voicing switch. Increasing the number of cascaded tube stages increases the preamp’s overall gain, so the more stages, the more gain, leading to more distortion. The Distortion knob replicates (as does the Tube Stage’s switch) its front-panel analogue, and allows you to fine-tune the onset of distortion across the multiple stages. The Low Cut Frequency knob controls a high-pass filter that models changing the value of the cathode-bypass capacitor in a real amp. Together with the High Cut Frequency (a low-pass filter) these create another means to tailor your sound’s frequency content. The Bias Adjust control lets you run the Bias Head’s virtual tubes anywhere between cold and hot, cleaning up or warming the basic sound of the preamp. The preamp stage ends with a three-band post-filter that’s identical to the pre-filter. 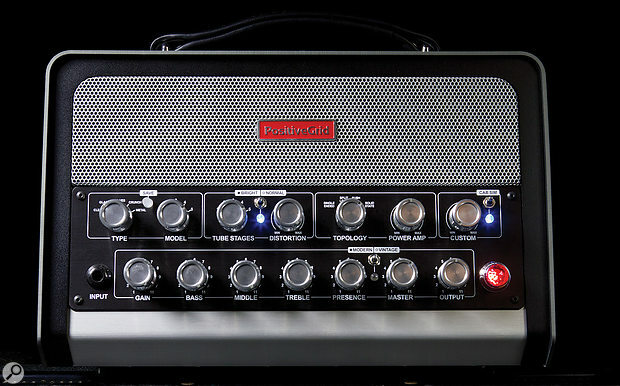 The power amp stage, like the others, offers a range of convincing presets, as well as supreme tweakability.The Tone Stack provides tone control choices based on nine classic guitar amps (five American, three British and one German), one British and three American bass amps, and two further EQs, one specifically for use with acoustic guitars and the other, Studio, a three-band sweep type. After the Tone Stack comes the power amp, whose options take you through the history of guitar-amp output stages, from the early days of single-ended Class A, through both concertina and long-tailed pair phase splitters (all of which are tube-based), to transistors. The classic output-tube choices of 6L6, 6V6, EL34 and EL84 cover every mainstream amp I can think of. The Head’s front-panel Master knob allows you to balance preamp and power-amp distortion, and the Distortion (the front-panel Power Amp) control gives you the facility to fine-tune the power-amp distortion. In addition, Splitter Gain gives you control of the amount of distortion in the phase splitter, and Power Gain determines the amount of distortion in the virtual amp’s output stage. But we’re not done yet! The Bias Adjust, as in the preamp, lets you run the power-amp tubes anywhere between cold and hot, which changes the harmonic content of the output. The Presence control cuts or boosts upper frequencies in the output by altering the frequency response of the negative feedback, whilst the Modern/Vintage switch takes you between the more forward sound characteristic of modern higher-gain amplifiers and the balanced, classic tube-amp sound. The final knob in the power-amp section, Resonate, modifies the impedance curve of the virtual loudspeakers, resulting in changes in the upper and lower frequencies, the nature of which depend on the output tubes and the transformer type. Associated with this is the Push/Normal switch, which modifies the power amp/speaker interaction to help the sound cut through a mix better than the more balanced Normal setting. The next module governs the power supply and output transformer settings. In the power supply, you have the choice of solid-state or tube rectification, via either a 5Y3GT (as found in early tube amps) or the later favourite, the GZ34. The attraction of tube rectifiers is the compression, or ‘sag’, that occurs when the output tubes require more current to accurately amplify a signal than the rectifier can produce — to model this sag, the ‘power supply’ sports a fully featured compressor. There are three transformers on offer: American, emphasising the upper mids; British, with slightly fuller low-mids and more highs than the American; and Fat, which has a broader mid-range and a more extended bass and treble response than the other two. The final module, Cab simulator, offers 23 electric guitar cabs, an acoustic cab, an acoustic simulator and four bass cabs. Each cab can be miked with a Shure SM57 or AKG C414, and you can change the mic’s position relative to the cone in all three dimensions. In case the EQs in the Preamp, Tonestack and Power Amp don’t quite do it for you, two further eight-band EQs can be inserted between any two modules (though not adjacent to each other), and the bands can be individually activated. Bands 1 and 8 are shelves, with the six in between being parametric. 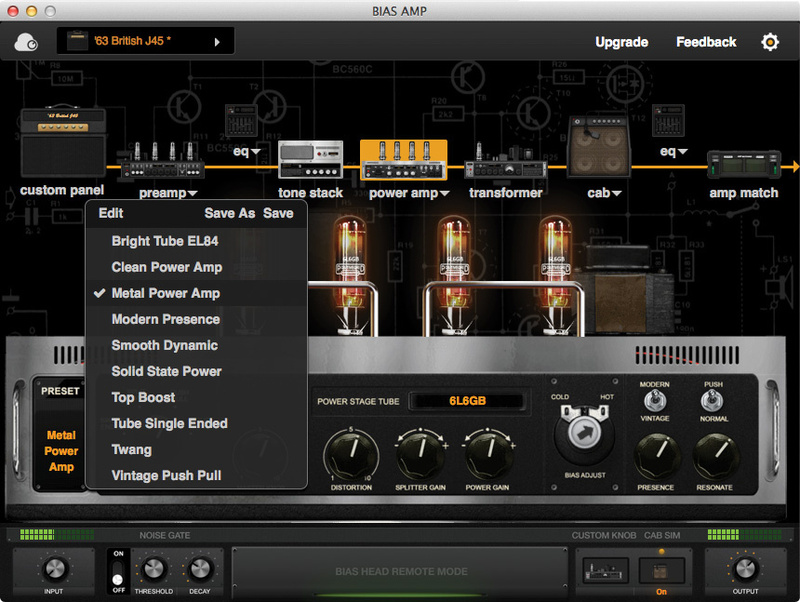 The Bias Amp software also gives you control of a noise gate, with input, threshold and decay controls, and allows you to set the Custom knob to give you instant access to one of a wide range of module parameters (stored on a per-preset basis). One of the Bias Head’s biggest selling points is the ability to (almost) automatically analyse your own amp, cab and mic signal chain and adapt a similar model to match its sound.In addition to the presets, Bias Amp Professional’s Amp Match function attempts to match an existing Bias Amp model to the sound of your own amp, cab, and mic chain — more on that later. 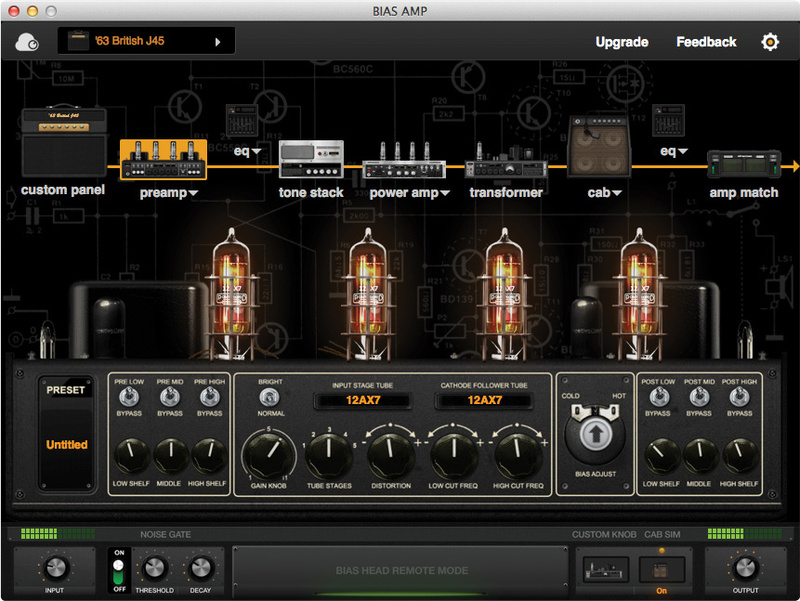 And Bias Amp Professional also contains a cabinet IR Loader, enabling you to load third-party impulse responses into a preset and transfer the result to the Bias Head. A Room Control lets you vary the ambience and reverberation characteristics of the simulated room, and a direct-access, eight-position, Quick Snap scratchpad facility lets you store versions of the preset you’re working on for quick comparison. As a stand-alone amp, there’s a lot to like. You’ve got access to preset selection, all the familiar tone and gain controls, you can change the amount of virtual preamp tube stages and modify the sound and distortion that’s produced, change the distortion in the emulated power amp, switch the cab sim in or out and, with the Custom knob, you can add an additional function to a preset. (This knob is the only programmable front-panel control that requires you to use Bias Amp.) If you use a MIDI floorboard, you can also recall patch changes and use continuous controller messages to change any front-panel function except Topology and Power Amp. I found making adjustments to distortion, frequency profile and levels in Bias Amp Professional very intuitive, despite the underlying complexity. The standard preamp (there are three more with varying switch and control complements) has 128 switch and nine tube combinations, plus five switchable tube stages and 11 rotary pots. Then there are the 15 tone stacks. 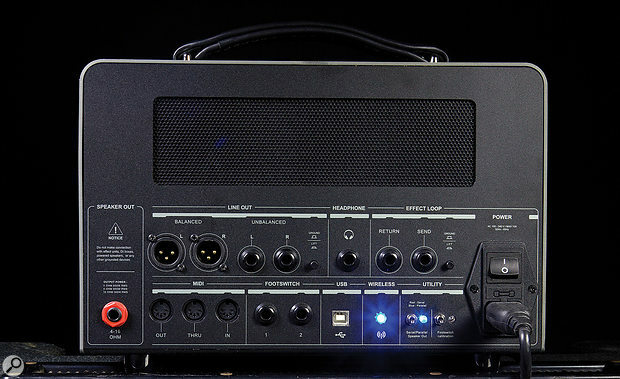 The standard power amp (there are three others) has 64 switch combinations and six pots. The transformer section has three rectifiers, three transformers and a compressor, and on top of that there are 30 cabinets — and we haven’t counted the twin eight-band equalisers. The mathematicians amongst you can probably work out the number of possible switch/rotary combinations, but, importantly, it’s quick to dive in and to use your ears and fingers/mouse. In short, so much is possible that you’re probably thinking it could prove a little bewildering — it isn’t. On the amp you can easily return to a preset, and in the software, the scratchpad enables you to tweak away, comparing results, without losing sight of where you’ve come from or where you’re headed. Overall, I was very impressed by the sound and performance of the Bias Head’s stock presets, both through guitar cabs (cab sim disabled) and through full-range amps and studio monitors with the cab sim. After editing a preset to taste and optimising it for the guitar being used, and with the Bias Head’s power amp driving into a 2x12 guitar cab, I felt that the combination got very close to the playing experience I get with the equivalent real tube amp. Running its 65 American Lux emulation into my 1x12 next to my original (somewhat modified) ’68 Deluxe Reverb emphasised, for me, the difference, in a studio situation, between playing through a real amp and a simulation. Although the Bias Head can be satisfyingly responsive and dynamic when played through a guitar cab driven by its own amp, I couldn’t quite get to where I felt I was playing through a real tube amp. But I don’t think that’s the point of amp emulators — what I want is to be able to enjoy and be inspired by the sound and the experience of playing, and the Bias Head makes this possible, whether driving a guitar cab or feeding studio monitors. Its preset amp models sound authentic across the five categories and for those whose real-world equivalents I know well, and although I’d want to do a bit of tweaking to match them more closely to my guitars and my personal taste, there wasn’t one preset that I thought didn’t convey the sonic and distortion characteristics of the real thing. The amp-match facility is impressive. Like the Kemper profiling amp (which takes a rather different approach to the same objective), there are small differences between the result and the real amp — though, importantly, the results do sound very good, and if you pick a model as close as possible to your own amp as the starting point, take a bit of care and do a bit of tweaking, it can give convincing results. Positive Grid aren’t about to give away their secrets, but it seems to me there’s a lot more going on here than EQ matching, and that there’s some intelligent tweaking of parameters going on. (Whatever it is, it’s feckin’ clever!). Of all the guitar-amp and bass-amp modellers I’ve tried, the combination of Positive Grid’s Bias Head and their Bias Amp Professional software tick more boxes for me than anything else. The Head’s build, components and cosmetics are all of high quality, it boasts great-sounding presets, the editing facilities are deep and extensive, and the user interfaces of both the hardware and software are completely intuitive. The Bias Head may lack onboard effects, but it works well with pedals and pedalboards, despite a couple of quirky restrictions on the effects-return routing. With its 600W Class-D power amp driving a real speaker, the Bias Head came very close to recreating the feel of playing through a real tube amp and, most importantly, the playing experience was both enjoyable and inspiring. Along with an effects loop restriction (in Parallel mode you can’t route the loop return simultaneously to the line outs with the cab simulation enabled and to the loudspeaker out with the cab simulation disabled; and in Serial mode, though returns can be routed to both outputs, the line and loudspeaker outputs cannot be used simultaneously) the complete absence of onboard effects might take a bit of shine off for some people. It’s certainly something that most amp-modellers offer, but then the whole point of the Bias Head is for it to be used like a regular amp — it does work perfectly well with real pedals in front of it, and that makes the effect return routing much less of an issue for me personally. High-quality build and sonic performance. Amp models are accurate and sound good. 600W Class-D amplifier, careful preset editing and optimisation can deliver a very realistic playing experience. Excellent user interface makes deep editing extremely intuitive. 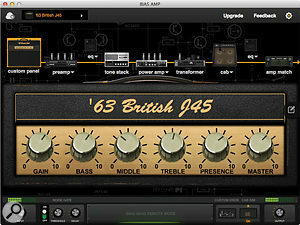 The Bias Head combines high-quality tube amplifier modelling and 600W of Class-D amplification to produce a guitar and bass amplifier head that, with careful preset editing and optimising for the instrument being played, can come very close to recreating the feel of playing through a real amplifier. The user interface to the extensive editing capability that is available is extremely intuitive and makes creating and modifying ‘amplifiers’ a simple process. 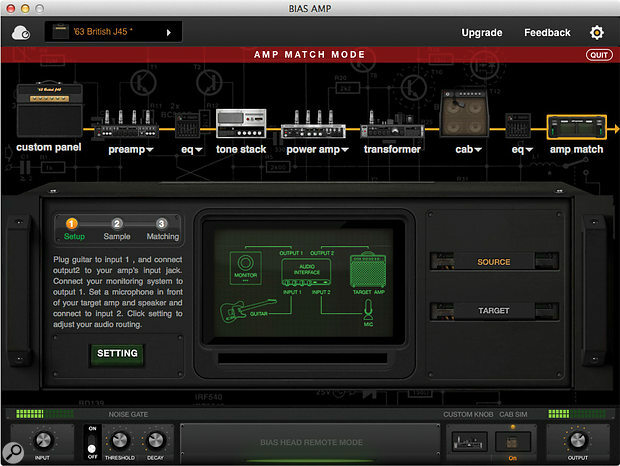 Its Amp Match feature allows users to capture and recreate the sound of your own amps.